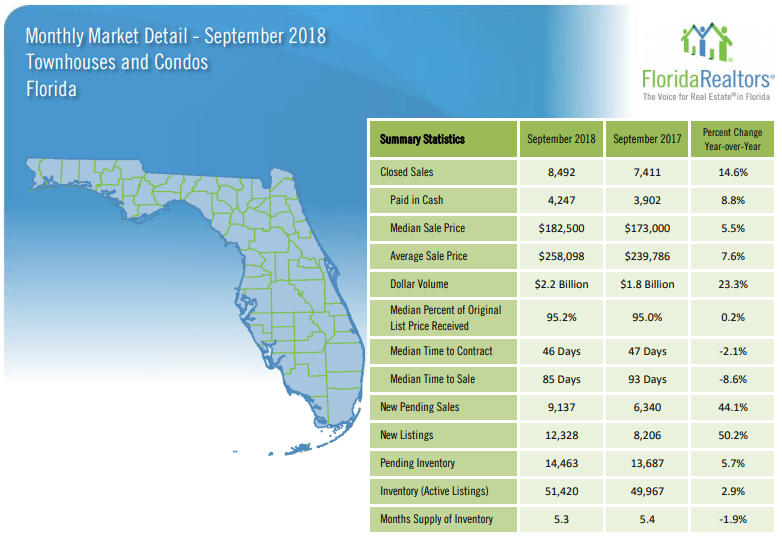 The Florida Townhouses and Condos September 2018 Market Report continues to proceed with stroger activity when compared to last year. Closed sales were up by 14.6% as compared to last month’s increase of 6.6% and new sales under contract (new pending sales) increased by 44.1% (In August there was a 3.8% decrease). Prices, also, continued to rise for September though at a slightly slower rate than in past months. Median sales prices were up by 5.5% (was up by 8.8% in August), while the average sales price increased by 7.6% (was up 10.1% in August). The inventory of active listings increased by 2.9% from September of last year. For September 2018 we have 5.3 months of inventory (was also 5.3 months in August) and compared to 5.4 months for September 2017. We remain in a seller’s market for Florida townhouse and condo sales. A balanced market favoring neither buyers or sellers is considered to be one with a 6 to 7 month supply of inventory.